The discussion comes up all the time. Does the wrestler make the title or does the title make the wrestler? 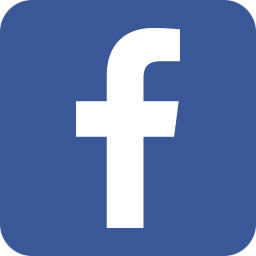 There’s certainly no straight answer, as both statements can be proven as true throughout a title’s lifespan. 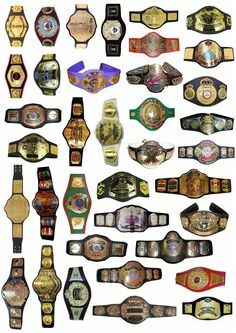 But for today, I’m focusing more on those wrestlers who made their belts feel important. Those champions who elevated their title to grander heights. The requirements to be on this list are simple; the wrestlers on this list had to leave the belt looking better than when they first won it. Whether it’s with long reigns, great defenses, or by the reputation of the winner solely, these ten men took their prizes and shined them up real nice for the wrestlers that followed. This one may just come from personal bias and nostalgia, but I think the selection is still valid. Gregory Helms has three recorded title reigns, one in WCW, one as The Hurricane, and this particular title reign that started at the Royal Rumble of 2006. In the year and change that followed, Helms was able to defend the title numerous times against a variety of opponents. He was also pitted in a few Champion vs Champion matches, against the likes of Chris Benoit, Rey Mysterio, and Bobby Lashley. Unfortunately, the prestige and importance of the belt remained near unchanged in the eyes of the Smackdown powers that be, usually opening PPVs, if not lost in the shuffle entirely. Within a year of losing the championship it would become inactive. Gregory places 10th on this list, but not for a lack of trying. The WWE put serious effort into making the U.S. Title mean something. Cena won the U.S. Title from Rusev at Wrestlemania 31, and what followed was a solid three months of weekly defenses, all in quality matches, plus two successful PPV defenses against former Champ Rusev. Following was a trio of fantastic matches with the debuting Kevin Owens. Finally losing the TV title to ROH World Champ-- I mean U.S title to WWE Champion Seth Rollins, Cena did his damndest to make the title mean something with his great reign. Unfortunately, the luster on the belt would not last. In the same length of Cena’s reign, the title changed hands five separate times. Nice try, Big Match John. Like Gregory Helms earlier in the list, Austin Aries held the X-Division title in TNA longer than anyone before him. Unlike Helms, though, Aries was able to use his status as a champion to be propelled to greater things. During his reign, Aries began his destined rise to the top, starting to challenge heavyweights, all while also defending his X-Division title. Eventually, Aries capitalized by creating “Option C”, wherein he surrendered his title in exchange for a World Title shot. Aries' effect on the X-division title lasted longer than with the Cruiserweight and U.S. titles, though it would return to its hot potato, spotfest status eventually. Now we get to the really good champions. Ones whose effect on their belt lasted much longer. The NEVER Openweight division was a concept developed in 2010 by New Japan, similar to NXT to keep it extremely simple. In 2012 they created a title for the brand, with the finals taking place on the last NEVER show. It left the belt with no real identity or purpose. Enter the third champion. Tomohiro Ishii, a man I believe was less born and more created when the spirit of Puroresu breathed life into a pile of $2 steaks, defeated Naito for the NEVER Openweight Championship, his first in the company. In under two years with four title reigns, Tomohiro imparted his own values onto the title. It became a belt about standing there and taking it, about what Japanese pro wrestling used to be all about. Credit definitely should be given to Togi Makabe and Katsuyori Shibata as well for helping form this identity, but the most credit should go to the Stone Pitbull. 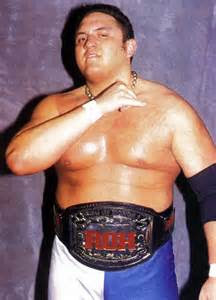 Samoa Joe’s title reign was ROH World Champion for almost 650 days, 21 months. The 3rd ROH Champion made the belt an official World Title with a defense in England. He defended the belt against opponents across the board and across the nation, and had a trio of defenses against CM Punk, one of which got a 5-star rating from Dave Meltzer. Even today, video packages that start Ring of Honor shows have images of Joe holding that really cheap looking belt with big red letters on it. We’d still have the Ring of Honor World Title today regardless of Joe’s reign, but he certainly helped assert the belt as one of the great titles of professional wrestling. For the sake of the list, and it’s my list so I can do what I want, I’m ignoring the NWA-TNA Heavyweight Championship when I’m talking about number 5. Kurt Angle was the first Champion in TNA, and it was the best choice they could have made in my opinion. Sure some people may yell that it should have been AJ Styles or Samoa Joe, and there’s an argument to be made there. But Kurt brought a combination of name recognition and legitimacy to the championship and the company in general. While none of his six reigns were particularly long compared to other men on this list, whenever Kurt held the belt and captained the ship, people noticed his ship. What TNA did with that recognition is another story entirely. Tomohiro Ishii took a nothing belt and gave it an identity. 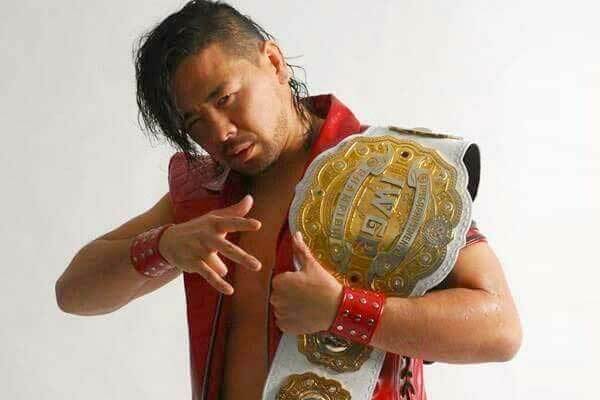 When Shinsuke Nakamura took the IWGP Intercontinental Title, whether by the grace of his standing or the quality of his matches, the championship instantly became important. 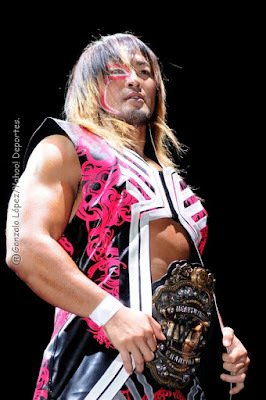 From the first time he won it in July of 2012, the remainder of Shinsuke’s career became centered on that belt, defending it against all challengers. When he lost it, it never took him too long to take it right back. He defended the belt in four consecutive Wrestle Kingdoms and successfully defended the title 17 times over a total of 905 days. Since he left, the belt has put both Kenny Omega and Michael Elgin on all new levels career-wise, due in no small part to the prestige layered on by Mr. Nakamura. I could talk about his current World Title reign right now, but his impact on the TV title is more important to me. The TV champ when I first started watching ROH, Lethal never shunned a challenge (Truth Martini did it for him occasionally, but let’s nevermind that). Over 567 days of defenses against the best of ROH and some of New Japan, he transitioned beautifully into a World Title feud with Jay Briscoe. Lethal made history, holding both the World and TV Titles at the same time, and defending them both successfully a few times. After the belt left Lethal’s hands, the world took the TV title much more seriously. Roderick Strong, Tomohiro Ishii, and current holder Bobby Fish have all been looked at with respect for holding the belt, and that belt is the target of many an athlete wanting to be part of the legacy that Jay Lethal almost singlehandedly built. No, shut up. I don’t care that he buried nearly all the RAW roster for the second half of his career. I don’t care that the majority of his work was slow and plodding in some vain attempt to make believe that he was some kind of new Harley Race or Ric Flair. The fact is that the first of RAW’s World Heavyweight Champions could only have been HHH. 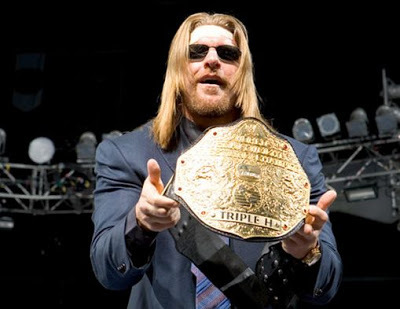 Already having golden qualifications, HHH held the World Heavyweight Championship for most of the period beginning Sept. 2002 and ending with Wrestlemania 21. In that time, HHH got both heat as a heel and heat as a jackass person. Each defense he got out of, each challenge he immediately shot down, the more people wanted to see him get beat. And for a returning Shawn Michaels, Goldberg, Chris Benoit and Batista, the momentum from their victories against the King of Kings was only bolstered by the fact they were taking the World Title from such an unlikeable human being. All this immediately legitimized the resurrected World Heavyweight Title, and would make it a prize worthy of being fought over. We’ve seen many different kinds of title holders on this list. Men whose impact ended when their reign ended, men who gave their belt a tangible personality, and some who elevated a belt to being a respected accolade in this industry. What separates Hiroshi Tanahashi from the rest of the men on this list is that he not only was a good champion with a long reign, the man saved his entire company from ruin as the flagbearer. The man with the record for defenses, and combined days, was champion in a bad time for New Japan. He can be given credit for bringing New Japan back to its former glory, and even beyond to being the number-two company in the world today. That’s a great feat by any measure. Today, the IWGP Heavyweight Title has become a prize coveted by wrestlers everywhere, regardless of company.